We are proud to offer this amazing bouquet. Lilies are a firm favourite of people of all ages from the very young to the young at heart. 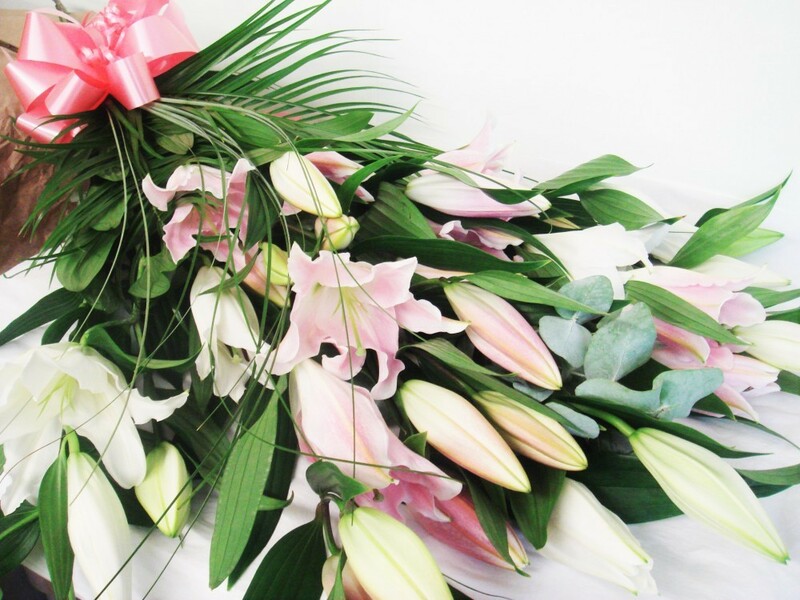 This gift wrapped bouquet containing only heavily scented Oriental Lilies and complementary foliage, will produce a wonderful fragrance in any home. If the recipient likes strongly scented flowers which are long lasting, this bouquet will definately not dissapoint! The Lilies and foliage are fresh from the Dutch auctions and arrive tight in bud, but in a couple of days will produce the most elegant display. These beautiful flowers will be wrapped in colour co-ordinating tissue paper and patterened cellophane, finished with a large ribbon bow. Together with the flower food to ensure longer life and your personal card message, this is the complete package, which will be admired by all! This striking bouquet is available in all white Lilies, all pink Lilies or a mixture of the two. If you have a preference to the colour Lilies you would like to send, please state this in the special request box, alternatively you are more than welcome to leave it to us to select the colours for you.